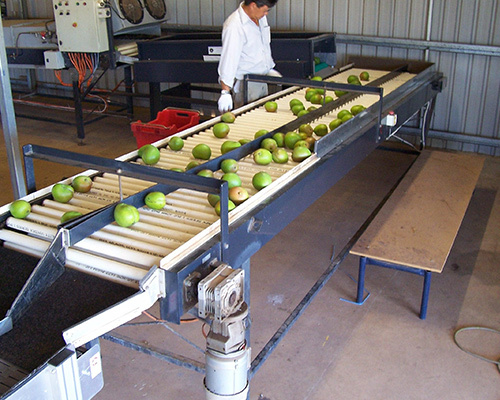 Fruit handling has become easier since the introduction of the conveyor system, however the early aging of the conveyor belt has remained the major issue and to address it, we have designed the sturdy range of the fruit conveyor belt that is designed to outlast and efficiently accomplish different angle of fruit conveying. The offered conveyor belts for fruit is made of the top grade PVC/PU material to impart the greater withstand capability even under harshest environments and outlast eternally. The material used is toxic free and also acclaimed by the FDA, exhibits its food safety quotient, which is essential for any food application and hence is highly used for fruit sorting. We are enriched with cutting edge technologies and years of experience in the manufacturing assorted types of the conveyor belts for the fruit applications, and hence are able to proffer the best solution for your fruit conveying need. We are proficient to design and develop a fruit conveyor belt for the flat, inclined as well as the perpendicular fruit conveying requirement that promises for the highest safety and reliability spanning the operations. Further, the excellent resistance of our conveyor belt against water, abrasion and cutting, allows its usage under any type of the application surroundings and ensure highest productivity throughout the life span. Our specialty in custom made conveyor belt is our mainstay, whereas our cutting edge technology promotes us to procure the highly reliable range of the fruit conveyor belt that outperforms without failing.